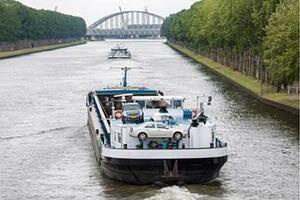 The Commission for Navigation for the Rhine (CCNR), a Multinational Organization with headquarters in Strasbourg since 1920, announced on Wednesday 10/31/2018 in a communique that ‘’the Rhine is confronted with a historic lowest water level’’. This study was conducted by the International Commission for the protection of the Rhine (CIPR). The International Commission for Hydrology on the Rhine basin studied the climatic scenarios and their possible effects on the river flow. The possible consequences were indicated for the Rhenish navigation. It was concluded that in the possible future, the water level will drop in the summer with low river flow and in the winter higher. In general the higher flow in the winter will surpass the lower flow in the summer and this will lead to an average flow level increase on a yearly basis. Studies conducted portray an increase in transportation prices; higher increase during lower flow and water level. The absences of dense precipitation in the last months has critically affected the water lever of the Rhine. Even though heavy rain is still to come and could ameliorate the situation, this rain will fill the sub terrains in the river bed before submerging on the river surface. This low water flow will stay critical for weeks to come. This therefore means tankers, boats and dry vessels will only carry a small amount of cargo. Transport professionals were more concerned with his alarming situation a few days ago. Transportation was almost completely interrupted In the mountainous areas between Bingen and Koblenz, where the lower Rhine merges with the upper Rhine. Goods have to be transferred to rail and then road in order to maintain the best transport chains. Some factories have cut down production due to this issue. Even though the situation in the Rhine stays critical it is under observation by the CCNR.